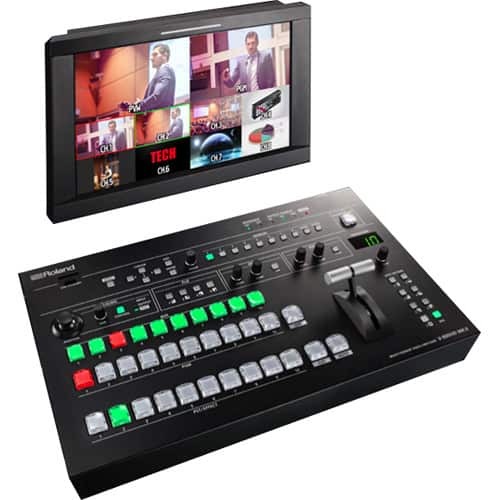 Live events requiring video production require a flexible video switcher like the Roland V-800HD MKII. This multi-format video switcher can accept a wide variety of sources and output them consistently to screens or projectors. Whether you're switching video for a live presentation or live streaming, the V-800HD MKII has the features necessary for high-quality video switching. A wide array of digital and analog inputs can accept feeds from media players, computers, professional or consumer video cameras, and more. Using internal scaling hardware, each input is separately scaled to the selected output resolution, ensuring output consistency between sources. This consistency is important, as it reduces input processing overhead required by the display or streaming box, minimizing dropped frames. While the feature set of the V-800HD MKII is expansive, it is also intuitive and simple to operate after the initial setup. Music venues, houses of worship, streaming media production companies, and convention centers that rely on volunteers or less-experienced technicians can take advantage of the rich feature set and ease of use, with minimal impact to existing infrastructure. All inputs are scaled and converted to match the selected video output format, ensuring consistent image representation from source to source. 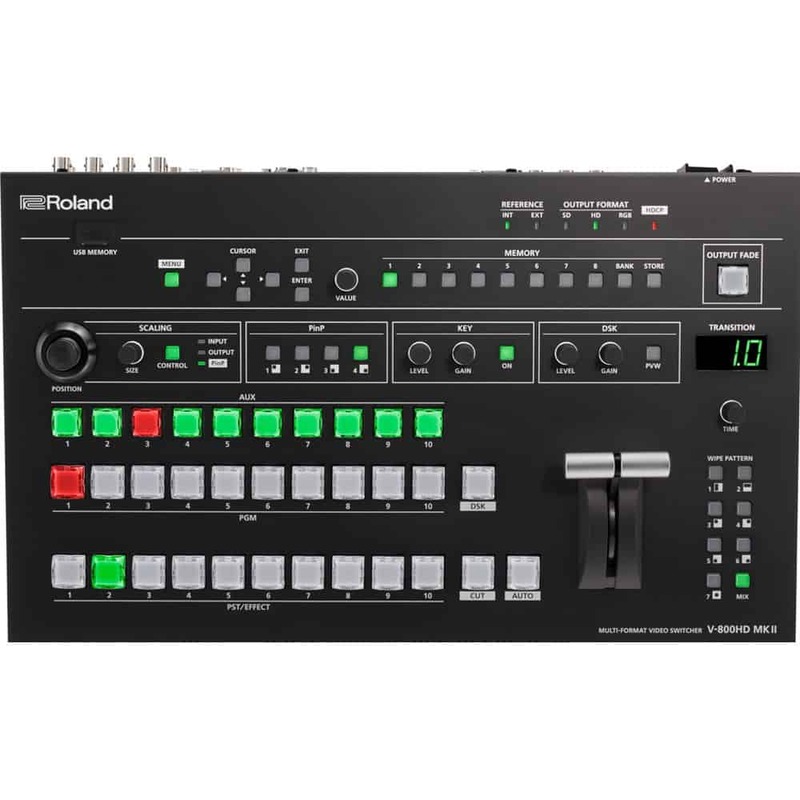 The V-800HD MK II supports many common input formats, from analog to digital, with all the necessary connectors. The SDI connectors accommodate SD, HD, and 3G-SDI. The DVI-I connectors provide input for DVI-D, DVI-A, and even HDMI using a simple HDMI/DVI adapter. The VGA connector accommodates SD/HD component, as well as analog, computer input. 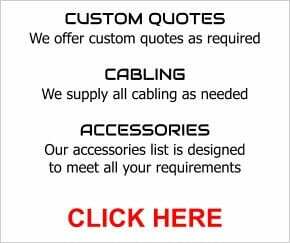 Easily switch sources connected to the assignable AUX outputs with the dedicated AUX layer switches. Use the AUX bus switch for selecting which source is sent to a confidence monitor or secondary destination. The V-800HD MK II uses 4:4:4/10-bit internal signal processing. This lets you achieve compositing and output with virtually no reduction in high-detail RGB signals driven from a computer. The result is a sharp display of video and text that remains true to the source quality, even on large screens and LED displays. The V-800HD MK II delivers high-image quality for all uses, from live broadcasts to event displays. Along with the improved internal signal processing over the previous generation switchers, an upgraded keyer is included. Chroma key lets you adjust phase range, amount of chroma, and other parameters based on HSV color space. This allows you to achieve high quality and tight chroma key compositing when using 1080p video sources. The V-800HD MK II can also accept an external key for compositing colorful CG titles and gradation/transparency clips. Connect a large HDMI display to the multiviewer output to see all your incoming video sources at-a-glance, including both preview and output. When playing back a Blu-ray disc containing commercial or other protected digital content, the digital output may be encoded using HDCP (High-Bandwidth Digital Content Protection). Switchers that are not HDCP-compatible will not display or pass such video content through, even when permission for use in a live event has been obtained from the copyright holder. To resolve this problem, the V-800HD MK II features a dedicated mode that officially supports HDCP by deactivating SDI and analog video outputs, thereby passing the HDCP-encoded signal to HDCP-compliant displays or projectors. A panel indicator lets you quickly check the operating state when the unit is in HDCP mode.